Special Containment Procedures: SCP-086 is safely contained in Wing-██ of Site-19. SCP-086 must be opened at least once weekly to prevent a migration event. During use, a variety of heavy weaponry and containment equipment is kept active and trained on SCP-086’s entrance, in order to incapacitate any emergent threat. The physical task of opening SCP-086 should be given to gloved D-Class personnel after the researcher has touched SCP-086’s handle with a bare hand. All testing of SCP-086 should be personally supervised by Researcher H█████. Entities which emerge from SCP-086 and are not immediately terminated or returned should be classified SCP-086-x. Greg Hollinger stood on one side of a sterile hallway, staring nervously at a nondescript white door. The footsteps of determined men and women in clean coats echoed through the corridors from some distance away. Greg took a step forward, then another. He stretched out his arm, brushed the bare metal knob with his bare skin, and flinched. Reached forward again, took firm hold of the doorknob. Felt an involuntary tremor through his hand and up his arm to his shoulder. A sense of purpose seized him, he jerked the knob and wrenched open the metal door. Inside the janitor's closet, there was a mop. There was a bucket of soapy water. There was an assortment of cleaning compounds. There was a small spider, which skittered out of view behind some boxes. And, on the floor, there was a letter addressed to a Dr. Gregory Hollinger. Still sealed. He picked it up, broke the seal sloppily with a finger. He read the letter inside, then read it a second time, then carefully folded it up and ripped it into a hundred tiny pieces and threw them all back into the closet, admiring the way they fluttered and danced as they fell to the ground. He closed the closet door and left the hallway, picking his way carefully through the danger signs and yellow tape he had set up. Description: SCP-086 can manifest as a portal to any relatively small contained space with a single opening. When SCP-086 is opened, an anomalous entity will be found inside. It has been confirmed by X-ray scans and cameras placed inside SCP-086 that these entities do not exist until the door is open. The entities produced are designed to frighten the last person who touched SCP-086’s opening mechanism (in host sites which lack a distinct opening mechanism the entire item will exhibit this property). SCP-086-a is a non-corporeal entity which manifests as a floating, partially transparent “dark patch.” If SCP-086's host container is destroyed or is not opened for a period of two (2) to three (3) weeks, SCP-086-a will emerge and roam aimlessly until it encounters another suitable space to inhabit. SCP-086-a passes through all obstacles it encounters and causes vivid hallucinations in any sentient beings it passes through. SCP-086 was discovered in an anonymously delivered, unmarked cardboard box mailed to Researcher H█████. Two weeks later, SCP-086-a manifested and entered a janitorial closet in Site-19, which was later designated SCP-086. If SCP-086 is closed with an entity it has produced still inside, the entity will vanish and a new one will appear when the door is open. It does not have this effect with any other beings or objects. 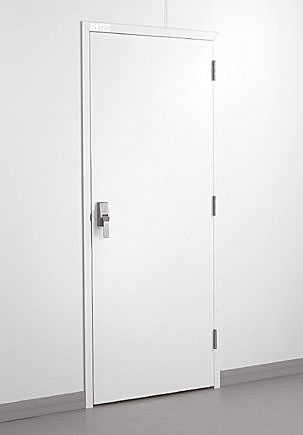 SCP-086 will not produce an entity or eliminate an existing one if the door is closed with a sentient being inside. However, SCP-086-a will migrate if a sentient being remains in SCP-086 for more than three (3) hours. Sentient entities produced by SCP-086 show extreme fear of SCP-086 and are highly averse to being returned to the closet. Thus far, all biological entities produced by SCP-086 have suffered from a major biological flaw, resulting in the entities' death within twenty-four (24) hours. Addendum 086-1: Brief log of anomalies produced by SCP-086. Entity: A large colony of [REDACTED], apparently spelling out the message ████ ██ ████. Entity proved non-viable and began to exude [REDACTED] from its pores. Subject showed considerable distress. [REDACTED] disposed of along with SCP-086's host box. Entity: A large creature made entirely of fist-sized, bloodshot eyes on tentacles connected to a small central mass. Subject screamed and retreated. Entity moved forward for several feet in a writhing motion before collapsing under its own weight. Autopsy showed no organs besides the eyes and a frail musculature. DNA matched no known animal. Entity: A small sheet of paper with a number of addresses listed in shaky handwriting. Subject displayed extreme stress but claimed not to recognize the addresses. Subject later volunteered to take on SCP-086’s study as a full-time project. ‘Ink’ confirmed to be dried human blood matching subject’s DNA. Entity: A very realistic effigy of a hanged woman, constructed of actual human skin with cotton stuffing. Subject reported confusion. Researcher H█████ identified the woman as his wife. Entity: A very convincing imitation of Agent █████’s current supervisor, which informed the subject he had been demoted to D-class for gross incompetence and handed him a printed notice. Entity collapsed of organ failure one hour later. Autopsy showed the entity lacked a digestive system. Agent Lawson stood outside the hallway and glared. “Why is this area blocked off?” she asked. “SCP-086 has taken up residence in the janitorial closet. It can’t be safely moved, so I’ve sectioned off this hallway. She walked away. Greg sighed in relief and returned to the door, which sat slightly ajar. On ██/██/20██, during a standard test with Researcher H█████ as the subject SCP-086 produced a scrap of paper with the words [REDACTED] hand-printed with large blocky letters. May indicate an attempt by SCP-086 to communicate. Further research is in order. ██:15: Researcher H█████ enters containment zone, clutching a piece of paper in one hand. ██:17: Researcher H█████ pushes the paper he is holding under the door of SCP-086. Intra-086 feed shows that this is the paper created in Incident 086-2. ██:22: Researcher H█████ opens SCP-086, using his bare hands. No entity is observed to appear. ██:23: (voice log) Researcher H█████: Who are you? ██:26: Researcher H█████ begins to cry softly. ██:29: Researcher H█████: How did this happen? Did [REDACTED] you? He stared at his hands — they were dripping. What was he doing, again? Oh yes. Escaping. He ran through the brightly lit hallways, feet pounding a steady rhythm, like a heart-beat or a set of drum-sticks pounding inside his head. Turning corners automatically, trying not to notice the walls melting behind him. Was he lost? The sun winked at him through layers and layers of heavy glass. ‘Exit’, promised the signs above the door. People were in his way, now. They wanted to stop him. He stared at his hands. Gregory Hollinger smiled. Now he could spend some quality time with his family. It had been terrible of him to spend so much time away from home. What if something had happened? Muffled voices yelled for help from the big wardrobe in the corner of the abandoned house; he ignored them. Astounding that there was nobody here before. Not the nicest place; in fact, likely to fall down any day now, but rent free. He turned a page of his book and frowned. Red stains all over the pages. Where did those come from? He put the book down. Someone was knocking at the door, rather loudly. No, he had barricaded the door and someone was trying to force their way in. That was it. “Not yet,” he muttered. “A little more time. I haven’t seen your mother since …” Where was she? His mind teetered on the brink for an instant as he scrambled for an explanation. He had seen her already, that was it. She had gone out to buy cleaning supplies. Lord knew this place needed a once-over. Splintering sounds from the entrance. Scratching from the corner. Pounding from his heart and head. Dripping from … somewhere. He had a sudden urge to wash his hands, but there was no running water. He should call someone about that, but of course, no phone lines. Reluctantly, he pulled himself up from the chair, careful not to step on anything. There was a loud crash, and several men in black suits entered the house. Greg was confused. Was he not calm? Was he doing something wrong? He took a step toward the wardrobe. A burst of gunfire shredded part of the ceiling. Another step. One of the men yelled something at him. He grabbed the handle. The door felt impossibly heavy — he pulled, and pulled, and pulled. A boy, about ten, bleeding from a gruesome head would, stepped out of the wardrobe. The men fired. Bits of gore sprayed the walls. The boy continued forward. Gregory cried and tried to embrace the child. It fell apart in his arms. Then the ceiling gave way.